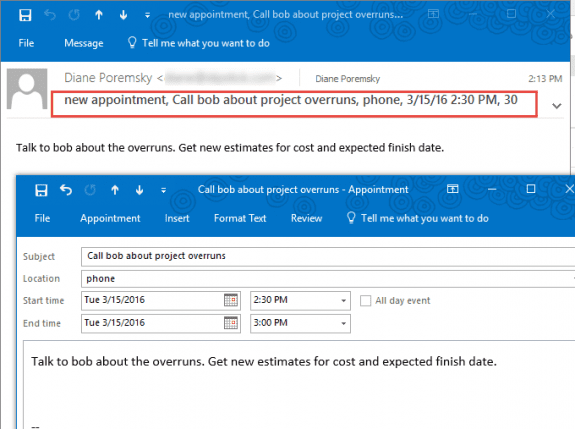 The macros on this page tweak the code from "Create an Outlook Appointment from a Message" to watch the Inbox for specially-crafted messages and create the appointment from the information contained in the message. To send the appointment as a meeting uncomment the meeting status, required attendee, and send lines. This code uses appointment data in the message body to create the appointment. then create a rule using the script. To learn more about Run a Script rules, see "Outlook's Rules and Alerts: Run a Script". Trying to do the "Use Appointment Data in the Message Body" option but when I select "a script" it is not listed as an option. Help! The run a script option is missing in the rules wizard or the script isn't visible? The first two macros are automatic macros - you don't use them with a script. The 3rd one Public Sub WatchForAppt(Item As MailItem) works with rules. Thanks Diane this has been super helpful for me. Could you tell me how to search for multiple keywords in the Subject line? I work on several different projects and the subject line will always contain the project number "1234" or "5678" etc. Thanks in advance. if you need more words, use an array. Thanks for the thread with the useful information. I was just wondering if it were possible to modify the script to have an apptArray optional. When i run the script and send and email with one piece of apptArray missing, a debug notification appears. I have the following script but would only like an ".End = apptArray(3)" as optional if entered in the subject field. 1. Add on error resume next - it may skip those lines when they error. Thank you so much Diane. The If Statement worked perfectly. Is it possible to do this for mail-enabled public folders? We have a shared team calendar and would like to be able to add entries to the calendar via email. Is it possible to run this script on the Exchange server or as a server-side rule so Outlook would not need to be running? You can't run it server side - it only runs if outlook is open. You can run it on a public folder though - as an itemadd macro. So I posted recently on another thread about opening URLs in email. So on that I got everything working great then I added a 3 click process through the link web browser. All very nice. So after that process is finished I get a confirmation email that confirms that process and contains client info... Only the body of the email contains client information,(adddress, phone , time , date, etc). So I have tried to create a rule, that automatically, sets category, priority, and moves it to a (active work orders) folder, and then a copy to the calendar. But the calendar does NOT automatically post a appointment. So my question is. Does script 2 in this post work for my needs. Its NOT a a appointment invitation that I'm receiving, but just a email that contains that info in the message body. Advice? you could watch the inbox, create the appointment, move the message and set the flags etc from this macro instead of using a rule. Or use the rule to call a Script that does everything (all actions need to be in the script). You have lots of options! so I am already running the open url Macro out of project1.vbs as module1. Do I just insert a second module, save it and it will work? Or do I create a different project? You can add it to the same module or to a new one, whichever makes it easier for you. I prefer separate modules if the macros aren't similar and put all functions into a one module since they can be shared by other macros. Outlook only uses one project file. And to separate them into 2 modules. I would change the above text to a Public Sub? Is that what this 3rd bit of code is for? Sorry I haven't had much time lately to work on this, but It would really stream line things if I got it working.If I recall making it public lets Outlook populate the 2nd module option in the script selection list correct? Correct making it public lets outlook use the value in another sub. As before, your code works great and thank you for the headstart in the outcome I was looking for. It seems my question from 5 days ago about showing conflicting times for an appointment created in a non-default calendar didn't make the cut/got deleted. Found a solution. Not deleted, I'm just way behind on answering. :) Do you mind sharing your solution? How would you alter this macro to cancel meetings using the same fields? For example a meeting cancellation email is received and the macro scans the message and cancels an appointment at that time. Sorry I missed this so long ago. Sets Items, it should be olInbox.